Now in its fifth year, the Computer Arts cover competition is open for entries. 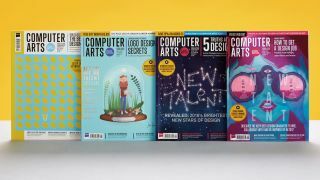 If you’ve got great ideas and a passion for design, this is your chance to work with Computer Arts and create a one-off cover, showcasing your talent to the creative industry. In partnership with our friends at D&AD New Blood, this year’s competition is offering a £700 prize for the winner, and with the addition of a special decorative print finish from our pals at Celloglas, this will be a unique addition to the winner’s portfolio! To enter you must be a current student or recent graduate (within the last two years). That includes mature students, and you can be based anywhere around the world. The issue your cover will adorn is our annual New Talent issue. Inside we will be looking at the very best of this year’s UK creative graduates. As such, we’d like a cover design that speaks to the spirit of new talent. You can visualise that anyway you want – be abstract, funny, literal, whatever – but it must be at the core of your design/illustration. The special print treatment from Celloglas will depend on what works best with the winning entry. Maybe it'll be six metallic colours, or scratch and sniff paper? Maybe, like last year's winning entry, we'll go for Mirri, or we might decide that glow in the dark works best. Take a look at what treatments Celloglas offers, and by all means tell us if you have a favourite! Download the cover template, and make sure your idea works to the Computer Arts' cover specification. Once you’re happy, you’re ready to enter! This competition is a little different to others, as it accepts mockups as well as finalised art. This is because entrants span designers, typographers and illustrators, so it may not be possible to provide the finished article straight away. Also, the winner will then need to work with CA’s art editor to make sure their entry works perfectly as a cover with a main hit and other coverlines. Therefore, we need some information about you, including a link to your portfolio, and a short paragraph giving it a bit of context to your entry – maximum 100 words. Send all that to hello@computerarts.co.uk. Entries will be judged by the CA team based on creativity of concept, its suitability for use as a magazine cover, and the quality of your existing portfolio – and the winner will receive a paid commission of £700 to develop it into a final cover with direction from CA's art editor. Deadline for entries: Midnight (BST) Sunday 24 June 2018. We will also showcase a selection of the best entries on Creative Bloq, including a paragraph about the artist and a portfolio link. Good luck! Hi-res artwork (or any amends) will only be requested from the chosen designer once the commission is set up. All IP remains with the creators, until a contract is set up with the winner.